Astronomers from the Dark Cosmology Centre at the Niels Bohr Institute have observed a super-bright supernova association with a very unusual long lasting gamma-ray burst. 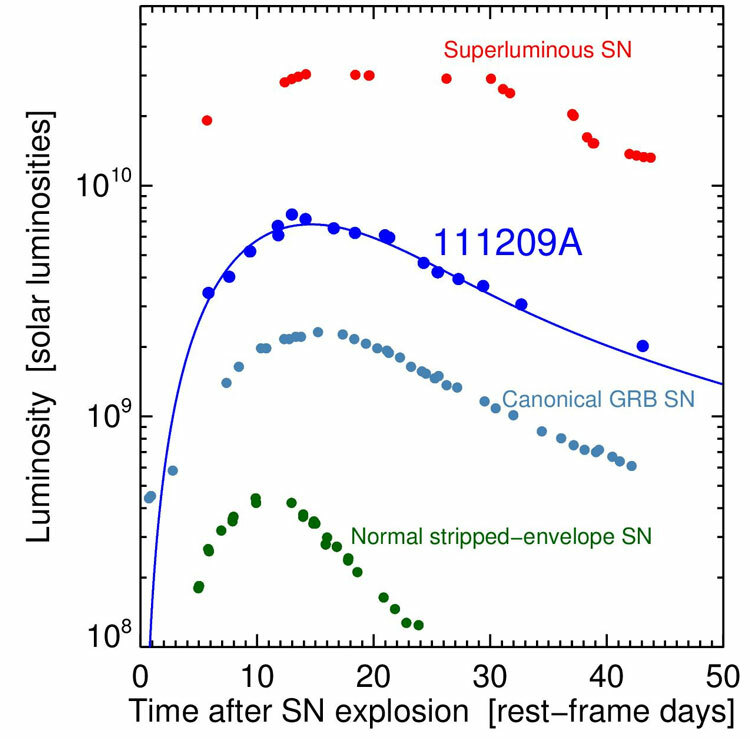 Gamma-ray bursts are in rare cases observed in connection with supernovae, which are the deaths of massive stars and they usually only last a few minutes, but the new burst lasted more than a half an hour. The supernova itself was extremely bright – more than three times as bright as the supernovae previously associated with gamma-ray bursts. The results are published in the scientific journal, Nature. Gamma-ray bursts are powerful bursts of gamma radiation, which is ejected out into space in connection with massive stars that die in a violent supernova explosion. A gamma-ray burst is typically short and only lasts a few minutes. However, in recent years researchers have observed several long gamma-ray bursts lasting over a half an hour, but they had not yet been able to connect them with a supernova. “We have now observed an ultra-long gamma-ray burst in excess of a half an hour and for the first time we have managed to connect it with a supernova,” explains Johan Fynbo, professor at the Dark Cosmology Centre at the Niels Bohr Institute at the University of Copenhagen. He explains that they first observed the gamma-ray burst from the Swift telescope in space. Gamma radiation cannot be seen from Earth as the gamma rays are stopped by Earth’s atmosphere. But as soon as you have the celestial position of the explosion, you start to observe the event from telescopes on Earth. Using the special GROND-instrument (which observes light in the visible and near-infrared wavelengths) on the 2.2 meter telescope at La Silla, a German-led research team managed to observe the afterglow from the gamma-ray burst over a period of 70 days. “We then observed the light with the X-shooter on the Very Large Telescope in Chile and the analysis of the spectra show that a very bright supernova is associated with the explosion. But the spectra look different than usual – they show that the radiating matter has a very high outflow velocity. We can therefore conclude that there was a very powerful explosion and that the supernova is about 15 times as bright as the supernovae we usually observe with the death of massive stars,” says Giorgos Leloudas, a postdoc at the Dark Cosmology Centre at Niels Bohr Institute and the Weizmann Institute, Israel. The combination of extreme brightness and a low content of heavy elements could indicate a massive star that releases extra energy in the death process. When the massive star dies, the core collapses into a neutron star that revolves very quickly and forms an extremely intense magnetic field. Such objects are called magnetars – a class of neutron stars that were first discovered by Chryssa Kouveliotou, who is a close collaborator with the gamma-ray burst group at the Dark Cosmology Centre at Niels Bohr Institute, which she frequently visits. “A magnetar has a magnetic field that is in the realm of a billiard times stronger than the Earth’s magnetic field (a 1 followed by 15 zeros). At the same time, these bizarre magnetars rotate several times per second and this is a gigantic reservoir of energy, which can facilitate a huge explosion, resulting in a particularly bright supernova and an extreme burst of gamma radiation, which is what we observe,” explains Johan Fynbo. The light from the super-bright supernova has travelled 6.4 billion years before it arrived at the Earth, so the incident took place about 7.3 billion years after the Big Bang. They arise in connection with a supernova, where a portion of the stellar material collapses into a black hole, while the remainder is expelled out into the universe. The dying star rotates very quickly in the process and a disc of incident material is formed around the black hole. Perpendicular to the rotating disc of matter are spinning magnetic fields and when new matter is pulled in towards the black hole, it is shot out into space by two powerful jets. The gamma-ray bursts are thought to come from these jets. The two jets are ejected in opposite directions at near the speed of light. Astronomers used to find supernovae by looking at known, large galaxies. Now they look with ground-based telescopes, which can scan large areas of the sky using new technologies. In this way, they have discovered several unusually bright supernovae in recent years. 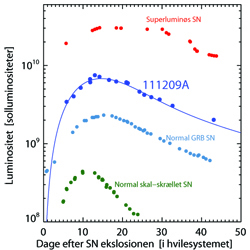 These supernovae can be up to 100 times as bright as ‘normal’ supernovae.